I’ve had Tweetbot 3 for a few days now and the more I use it, the more I like it. 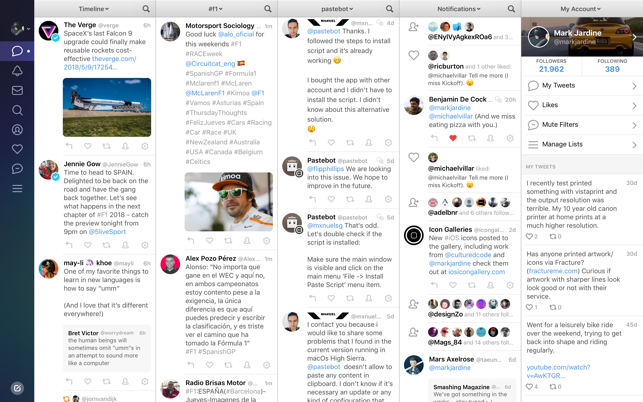 Compared to Tweetbot 2, there are some jarring changes but the modernization of it like the ability to see multiple photos in a row without opening separate windows or video directly in your timeline is fantastic. I equally love the idea that on one account, I can hit reply and then change which of my many accounts I actually tweet from (this is a fantastic option for those of us who manage multiple accounts). As others have noted too (and as seen in the screen shot), you can just have icon view for everything on the left if you like by simply dragging the column width left. Like all software upgrades, it’s not about carrying over everything from before and building upon it but by looking at the whole thing from a different perspective. I also trust that like all software, things will further improve over time. For anybody new to 3rd party Twitter clients (let’s see how much longer they last), Tweebot 3 is an excellent choice to go with. For those coming from Tweetbot 2, it will take some time to get used to the new UI but over all, it’s been solid. My guess is that you wouldn’t be reading this if you already weren’t a user of previous versions of Tweetbot. But if you aren’t familiar with it just get it immediately. Just get it. Those who are familiar with its predecessors will be reading reviews here to find out if it is worth $10 to move from 2 to version 3. First of all, it would be worht it even if there were no changes. How often do you use Tweetbot? If you think of speding 10 cents a day it pays for itself in a few months. But it has a great new layout for the Mac. Previous versions tended to use space the way that you would on an app for a phone. 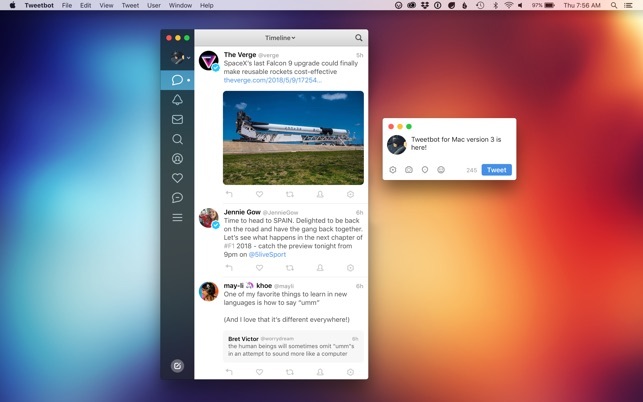 Tweetbot 3 gives improves its use of space for the desktop/laptop so that more information and possibilies are at your finger tips without confusion or clutter. After only a few minuties I saw my various feeds in a new light. Obviously, I haven’t tested much. But there is a clear benefit immediately. Authorizing any new Twitter client is a pain. Tweetbot handles that well, but do be prepared to deal with that when you set up a new client. Over the years I’ve always felt like Tapbots have been a premiere developer. 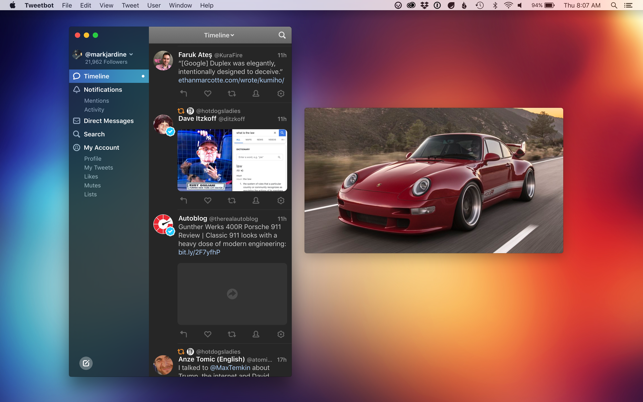 I bought Tweetbot for Mac back when it was insanely expensive and hevn’t looked back. With this “upgrade” I’m not so sure. It’s not the app is bad. 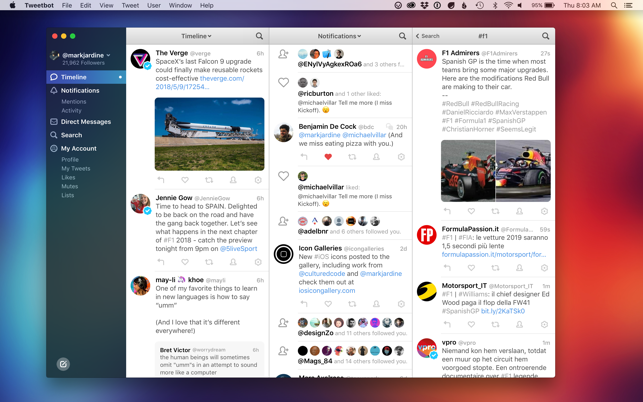 What it has ended up doing is simplifying their app and dropping a lot of the functionality and control that I loved about Tweetbot for Mac 2 that I love. The navigation bar on the side is faily large and I can not find a way to make it any smaller than it is by default (I prefered the side bar in the previous version with icons only but now I get icons and text and it takes up a lot of space). Gone is the ability to show multiple lists next to each other unless I open a new window which includes the very large side navigation bar. 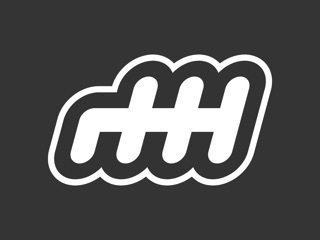 On the plus side I can now use the arrow keys to move between images when a post contains more than one image but I’d gladly give that up for multiple columns and the ability to make the side navigation bar smaller. 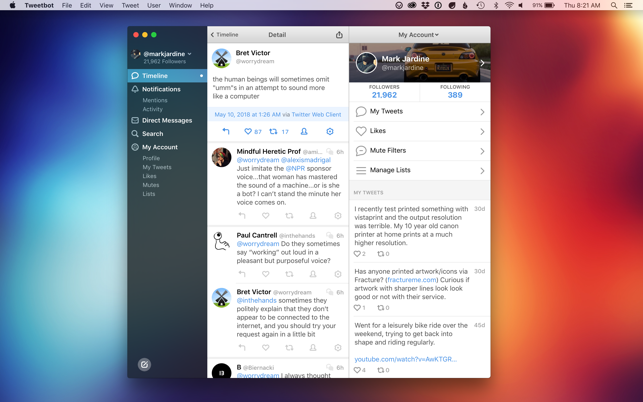 On the whole I think I’d recommend Twitteriffic over this but definitely Tweetbot for Mac 2 over version 3. You can resize the navigation bar by dragging on the divider, please read more info about it at https://tapbots.com/tweetbot/mac/tips/. You can also drag multiple lists to different columns, please see above tips page for more info on that too.